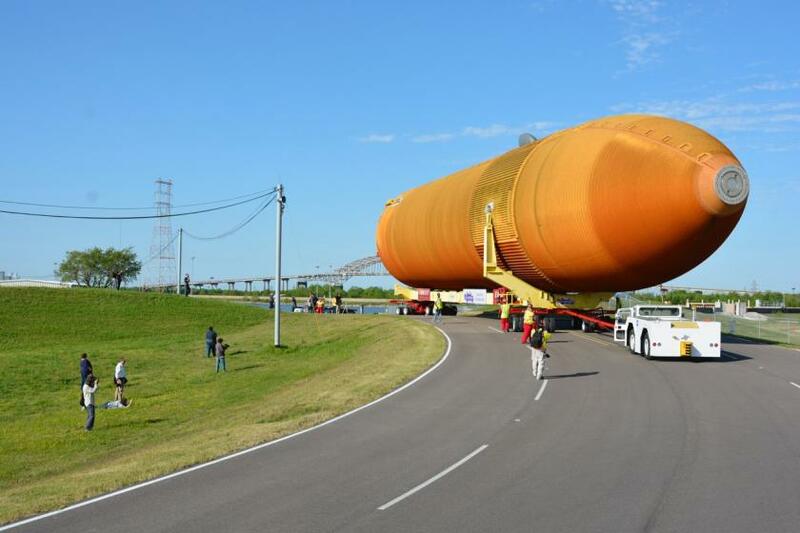 We are getting you ready for the arrival of ET-94, the 15-story tall space shuttle external tank that will navigate its way through the streets of Los Angeles County later this week. From its arrival in Marina del Rey early Wednesday morning to the start of its trek to the California Science Center late Friday night, we’ve got you covered every step of the way. We’ll keep you updated with photos, videos and more, so stay tuned to our Facebook and Twitter! 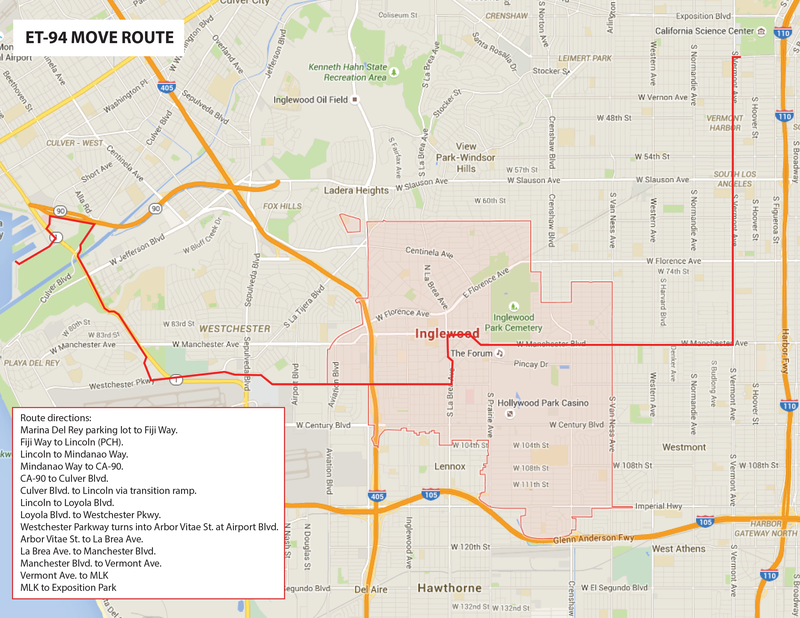 Here’s the route ET-94 will take through the streets of Los Angeles and Inglewood to its new home at the California Science Center. The tank is expected to arrive in Marina del Rey around 6:00am on Wednesday, where it will remain until it’s loaded on to a custom transport vehicle, and starts its trek across town on Friday night at midnight. The tank will be accompanied along the route by astronauts who actually flew missions into space! We will be live streaming the tank’s arrival and departure on Facebook and Twitter. There are plenty of great spots along the route to take pictures and video to capture this incredible experience, so be sure to use the official hashtags #ETComesHome and #SpotTheTank. Loyola Blvd. to Westchester Pkwy. Westchester Parkway turns into Arbor Vitae St. at Airport Blvd. 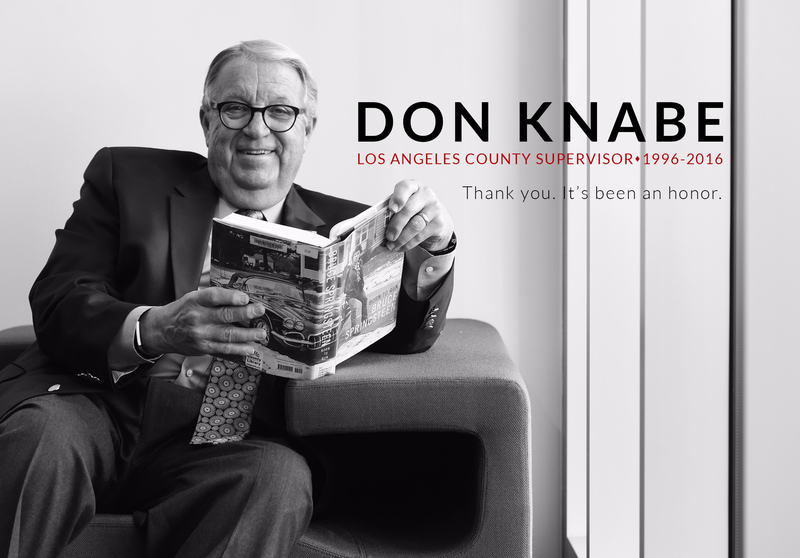 Arbor Vitae St. to La Brea Ave.
La Brea Ave. to Manchester Blvd. Manchester Blvd. to Vermont Ave.
Planning to visit ET-94 while it is in Marina del Rey from Wednesday to Friday? Plan ahead! Public parking lots are available throughout the Marina, with rates ranging from $5 to $15. On Friday, May 20 there will be limited parking in the lots located along Fiji Way.The best areas for parking are lots #4 and #5. Free public transportation will also be available via the water taxi and beach shuttle. Huge crowds are expected throughout the week, so please allow for extra time to park. The water bus and beach shuttle will be operating for free, so don’t be afraid to park farther away from ET-94. 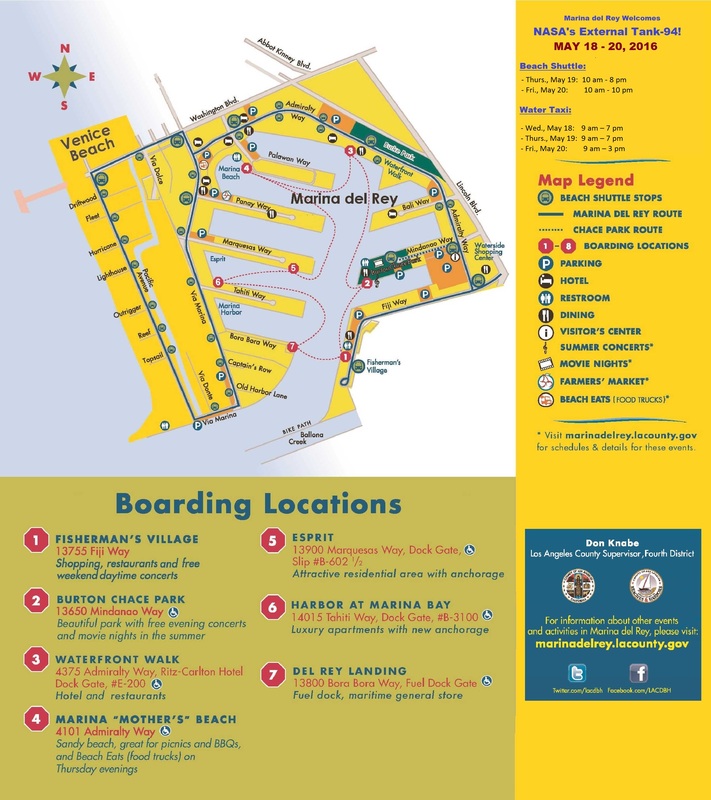 Free water taxi service will be available at seven boarding locations throughout the Marina from 9:00am to 7:00pm. Free water taxi service will be available at seven boarding locations throughout the Marina from 9:00am to 7:00pm. Free beach shuttle will also provide roundtrip service from Playa Vista, Marina del Rey and the Venice Beach Pier from 10:00am to 8:00pm. Free water taxi service will be available at seven boarding locations throughout the Marina from 9:00am to 3:00pm. Free beach shuttle will provide round trip service from Playa Vista, Marina del Rey and the Venice Beach Pier from 10:00am to 10:00pm. The shuttle will stop at all municipal bus stops that are along the route. 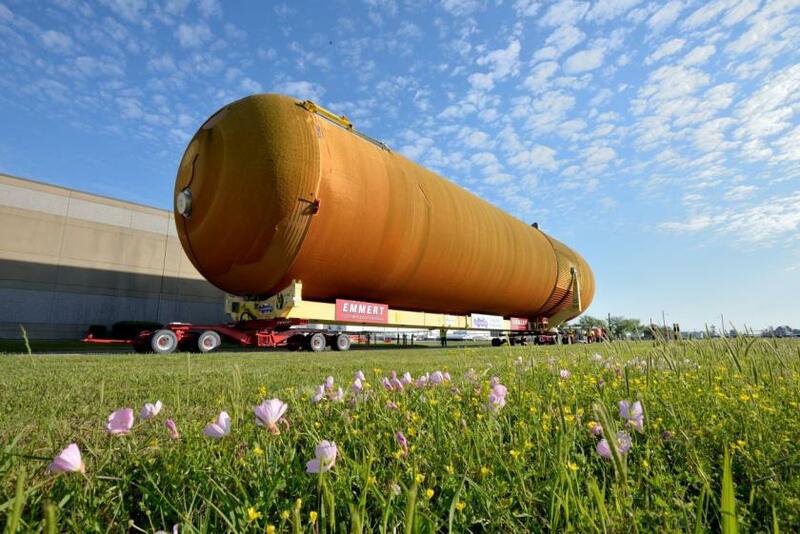 The External Tank is scheduled to leave the Marina late Friday night at midnight. Various street closures and detours will be in effect from 10:00pm to 1:00am. Marina del Rey is thrilled to welcome ET-94 to Los Angeles County! To celebrate this historic event, the Department of Beaches and Harbors is organizing a “Party in the Park” on Friday, May 20 from 5:00pm to 9:00pm. 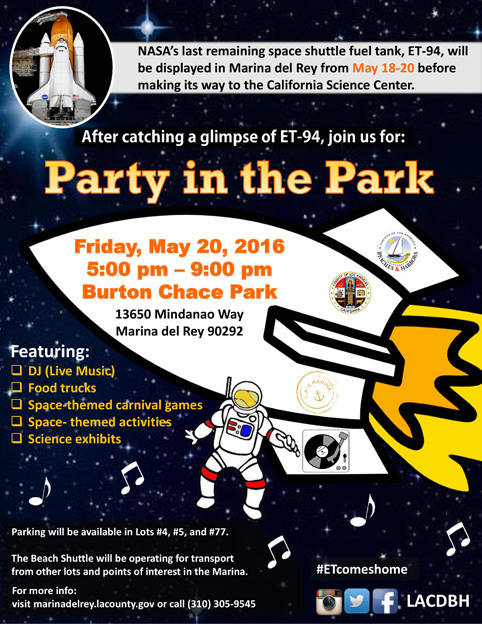 The free event will feature a DJ, food trucks, science exhibits, space-themed activities and more! When it reaches the California Science Center, ET-94 will join the space shuttle Endeavour to create the only existing full stack in the world. 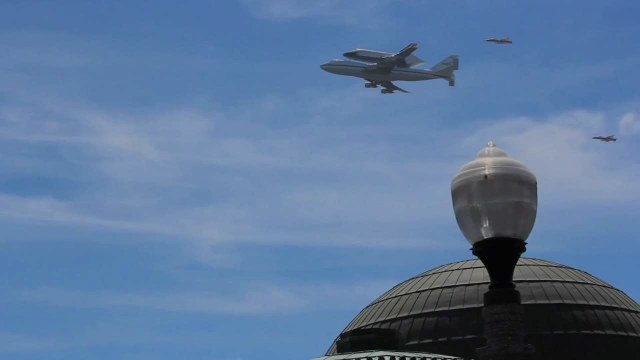 In this video, flashback to 2012 when the Endeavour made its own dramatic arrival in Los Angeles County.